As promised, this is our daily routine for caring for our precious hens. I usually do the early stuff and look after them through the week, then my husband looks after them on Saturday and Sunday morning whilst I’m at work. Our son helps too, mostly with collecting the eggs! 5.30-7am depending on the time of year. I get up and let the hens out of the house, I watch them all come out to make sure none of them are injured and that they all look normal. I take the droppings out of the nest boxes, top up the feeder and put fresh water in the drinkers. 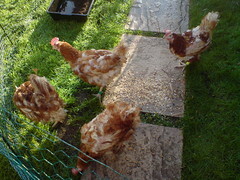 The hens are then let loose into the garden for about 3 hours if I’m working, or all day if I’m home. 8am I change the newspaper in the poop catching trays in the houses, top up the nest boxes and collect any eggs that my have been laid already. If the girls are still laying, I’ll leave the newspaper changing till later, as they really don’t like being disturbed when they’re ‘busy’. I give the garden a quick poo pick and check on all the girls. 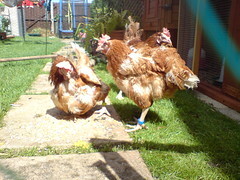 The girls either stay in their pen whilst I’m out of the house, or they just roam around our garden for the day. We have an enclosed garden with a high fence border which also has high trees and bushes. As we live in the middle of a residential estate, foxes are only seen out at night. Our estate is surrounded by woodland which is full of bunnies, which I guess are slightly more accessible than hens. I check on the girls regularly and can see them out of the kitchen window, I actually spend a lot of time watching them too!! They are addictive and very amusing to watch! 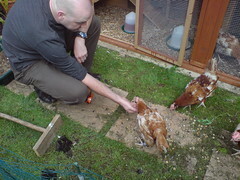 I poo pick quite often whilst I’m home and also interact with the hens as I do this. Bunty enjoys following me around the garden trying to scratch the contents of my dustpan back out onto the grass again…. not very helpful, but everso cute! 12pm I come out to re-check the feeders and drinkers, check for eggs and poo pick again. I also like to give the girls a little treat at lunchtime, whether it’s some sultanas or cheese, just something to get them all excited! 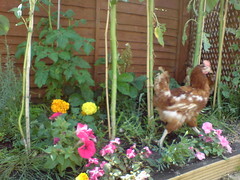 I also like to move the plant pots around too, just so the girls can get any worms! 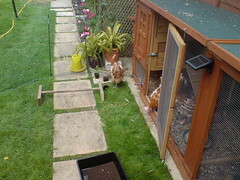 2.30-3pm I put the girls into their pen, mostly to give the cats a chance to enjoy the garden! My cats are getting on a bit now, and mostly sleep in the house during the day, so just before dinner time, I put the hens away, the cats come out and have a leg stretch!I poo pick the garden, top the feeder up if needed and check the drinkers again. I make sure the houses are still tidy, or change the newspaper if I didn’t get to do it earlier and make sure everything is ready for bedtime. The girls will now have some time in their pen, they have branches to perch on, a dry covered earth area to dig and dustbathe in and their run which is on concrete slabs for when it’s raining. They always have somewhere dry to stand and we’ve made sure there is plenty of shelter and space to avoid squabbles. The girls also have plastic shatterproof mirrors in their run, which they all enjoy and even perch on top of! The hens will put themselves to bed when it starts to get dark. Again, as with the waking up time, this varies depending on the time of year. Earliest will be about 4pm in the winter, the latest is about 9.45pm in the summer. We can hear our hens quite easily in the lounge and I can check on them very easily from the kitchen. You need to watch your hens, although they take care of themselves, you need to be very predator aware, especially with ex-battery hens. Ex-battery hens won’t have had the chance to develop hen skills and will have no experience of the outside world when you get them. It’s very important that your housing and pen area is predator proof. This is another reason we have our run on concrete, so nothing can dig into it. 4pm-9.45pm depending on the time of year I go out and shut the hen house doors and also bolt all of the run doors. I make sure the catches on the nest boxes are closed and clipped shut (we use a hasp and climbing clip to ‘lock’ the nest boxes). I also check the climbing clips are in the bolts of the hen house doors (this means only animals with thumbs can open it!). I personally think padlocks are a bad idea, just in case you need to get in quickly, but again as I’ve said before, it’s personal choice. I do have a solar powered light for the pen and the run, but I only use these in the winter just to poo pick once the girls are locked in. An extra daily job should be checking the integrity of your garden fencing, checking that hole digging isn’t getting out of hand and generally making sure the area is safe. Once a week, I scrape the houses down with my paint scraper and scrub the perches with a weak Jeyes fluid solution. I check for red mites and any other beasties everyday. They usually hide under the ends of the perches, in fact any nook and cranny in your house. This is why it’s very important to be vigilant even in winter. The feeder and drinkers get scrubbed out thoroughly once a week, but both are checked everyday. The drinker can be checked by rinsing, and running your finger round the drinker, if it feels slimy, it needs a scrub. This is most important in the summer or if your drinker is sat in sunlight, as this will accelerate algae growth. The bedding in the nest boxes is changed once a week. As previously mentioned, I use shredded paper from the office, but again, it’s personal preference. I’ll scrape the paving slabs in the run, especially the areas the girls like to sit (usually closest to the house in case I come out with food….) and give the slabs a scrub with the weak Jeyes solution. The patio needs a scrub at least once a week too, as the girls love to hang out there. Monthly jobs include red mite powdering the birds, worming (added to the feed), louse powdering the birds and buying new feed! My birds go through a 20kg sack of layers meal every month. 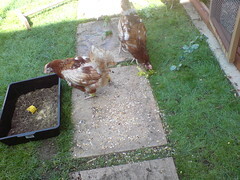 They do eat a lot of food, especially newly released ex-battery hens! Yearly jobs would mostly include re-painting/treating your housing, depending on what it’s made from. Also things like preparing your garden for the year ahead (hen proofing the veg patch!) and making improvements of repairs. So that’s how I take care of my girls everyday. Hopefully this will help you if you’re thinking of getting hens. It’s different for everyone and really depends on what space you have and what suits you and your birds! So, in part one, I talked about the things we found most useful in our first year of keeping hens. This time, I thought, ‘what about all the other stuff?’ so, here we go. When deciding if hens are right for you, there are many things to consider. 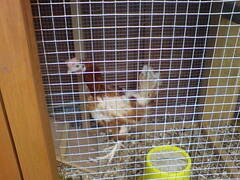 In another post, I’ll write my hen routine down, as maybe it might give you some ideas as to what is involved. “Do I need to get up early?” Probably….They are generally very easy to look after and most of the time you’ll be cleaning up after them and enjoying their crazy antics. 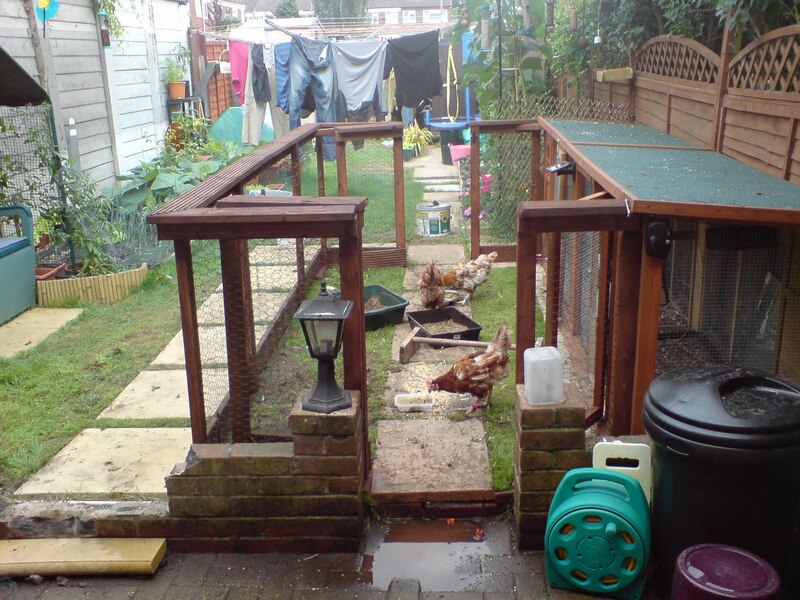 Unless you have a huge garden with no neighbours or neighbours with hens, you will need to get up early to let them out, especially in the summer. There are electric door openers, but the best time to see if something is wrong with your hens, is when you let them out. In the summer, I get up at 5.30am and then as the summer draws on and come winter, I get up at 7am. They wake up as soon as it gets light, we have the windows blacked out, but the wild birds usually give the game away! “Are hens noisy?” My hens are for the most part, very quiet. They were in my garden for at least 3 months before anyone (aside from my direct neighbours who we consulted before getting hens) actually asked me if I had chickens, as they thought they heard some! But on the odd occasion that a hen feels the need for public speaking, it’s quite loud. I tested their range once, by walking round to the back gate when one was ‘bocking’ at the top of the garden (where the house is) and it sounded like a goose! Thankfully we have a lake with geese, ducks and such on our estate, so bird noises are part and parcel of living here! They make quiet noises, chatty little clucks and funny cooing noises all the time, but they are quieter than the local sparrows, magpies and crows! “Will they bother my neighbours?” My neighbours are generally pretty understanding and I take measures to ensure that the girls won’t kick off at 6am, although sometimes, it does happen. I find doing things like sprinkling sultanas in the grass for them to find or some mixed corn helps to keep them amused long enough for them to stay quiet. They also have learned to associate a little tune I whistle for them with food or exciting stuff, so if one starts to shout, I whistle and it distracts them, usually keeping them quiet. Sounds silly, but it works. I would say, with any animal that has the potential to be noisy, it’s always best to have a chat with your neighbour, just to make sure they won’t be overly upset by your new additions. We also checked with the council too as an extra precaution. “What about the poo?” Next, the cleaning up. Hens poo a lot. It’s also worth remembering that birds don’t wee, it’s all mixed together and can be quite smelly. Approximately, every 10th poo, you’ll get a sticky green, yellow coloured poo called a caecal dropping, as well as looking gross, it also stinks. Generally though, the droppings are fairly easily picked up. I use a plastic trowel and an old dustpan. I use the brush and dustpan to clean up small dust piles, as the hens enjoy emptying the flower beds onto the path….. A handy link all about poo! 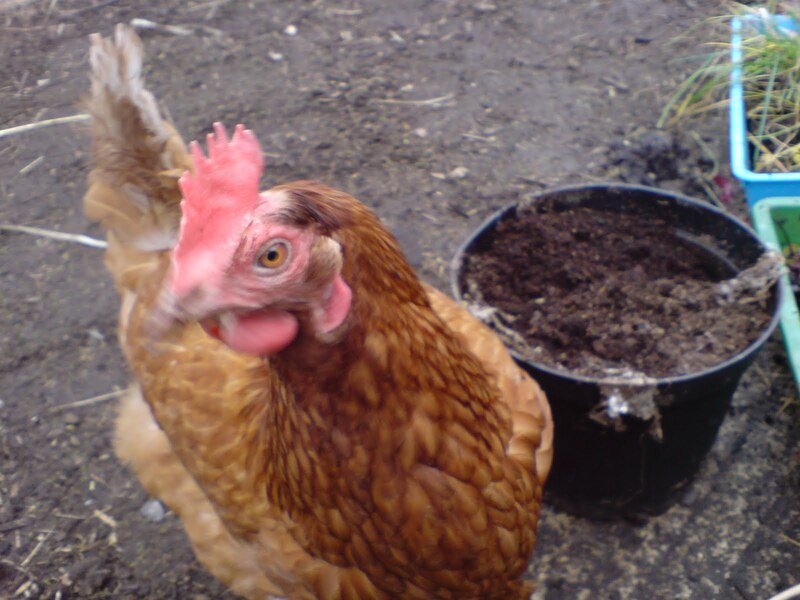 “Can I use the droppings on my plants?” If, like me, you have a small garden with a bit of grass, it is important to pick up regularly after your hens, as droppings left on the grass will burn it. Hen droppings are fab as they have a high nitrate level, which, once rotted, makes excellent compost, but if you try to use it on your plants when it’s fresh, you can burn your plants. 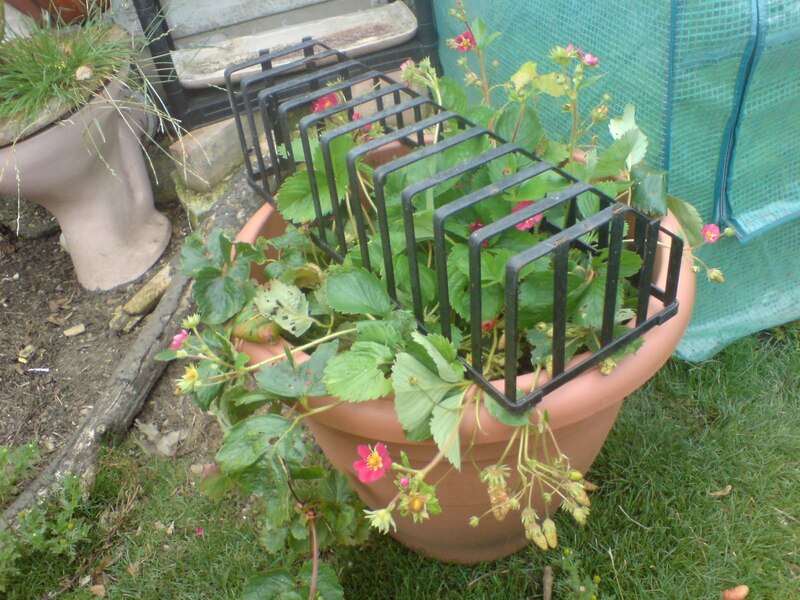 I have a plastic skip which I use to ‘poo pick’ and once I’ve tipped the droppings into the compost bin, I wash it out with the hose and tip the water on the flower beds or veg patch…. this seems fine. The hens will need a thorough clean out once a week, although it’s wise to stay on top of the cleaning and clean their housing regularly. “Is cleaning them out hard?” Our housing has pull out muck trays, which are great. I put fresh newspaper in the tray and tip the old, soiled newspaper into the compost bin. This saves time and usually, I only need to scrub the much tray once a week. 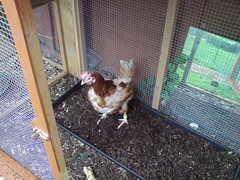 The nest boxes need to be poo picked once the girls have been let out, otherwise your lovely eggs will be laid into poo. Just saves you having to clean it off! Diatomaceous earth or similar mite prevention powder – I prefer the earth as it kills all the beasties that my bother your birds and it’s 100% safe and natural. Other than these things, you can use your imagination, find a routine that suits you and stick to it. So long as you aren’t lazy about cleaning your birds out, it’s a doddle! “Are they fun to keep?” A sense of humor is essential. Hens have a great sense of humor. They can make mischief out of anything! Just when you think your veg patch is safe, they’ll find a way in! Remember that hens can jump pretty high, they can dig and they really aren’t stupid and you’ll be fine. 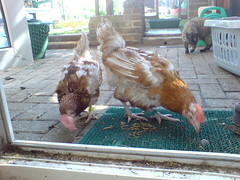 Distraction seems to be the key to avoiding havoc (with our hens anyway!) so giving them plenty to do and think about, will keep them out of mischief. They all have individual personalities and you’ll have great fun finding out which is the bossy one, the shy one etc…. 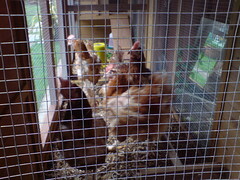 “What about our cats?” We have 3 cats as well as our 8 hens, and generally it’s understood that the hens are in charge. Our cats were 9 and 10 years old when we got our hens and the cats really didn’t know what to make of the hens when we got them. 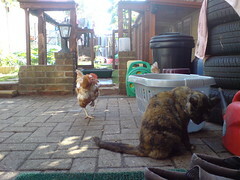 But after being chased down the garden a few times, the cats saty out of the hens way. Neighbourhood cats show an interest and will spy on the hens from a far, but I’ve not seen any other cats in our garden for ages…..
“What happens when one gets ill?” Hens are generally tough as old boots. But, when you notice one isn’t right, she usually really isn’t right and so some quick thinking and a bit of book knowledge can help immensely. It’s also worth looking in your area to find a vet with hen knowledge, as although hens are popular pets, some vets still have limited knowledge of them or are just not willing to acknowledge them as pets. The British Hen Welfare Trust – list of hen friendly vets. 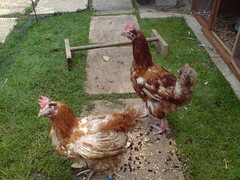 Here is a link for the BHWT website’s hen friendly vet list. But do some research! A good chicken book can help, we found the Haynes Chicken Manual very useful and you can find near enough anything on the net! But as with any animal, try not to panic, don’t be afraid to ask for help and do what you can. You’ll very quickly find your feet and feel confident to deal with most things. I’ll be writing a part 3 soon. I’ll show you our routine for caring for our hens. I’m sure I do more than is required, but that’s just how I am! It comes from working with horses for 20+ years and being slightly OCD!! I thought it would be nice to put together a list of things that we have found useful in the first year of keeping hens. Firstly, the hens, as I previously mentioned, are ex-battery hens from BHWT (British Hen Welfare Trust) a brilliant charity who rescues hens at the end of their battery life (18 months old on average) and finds new homes for them. You can buy hens from breeders and farms but these hens are in need of a home and make wonderful pets for any backyard hen keeper. You don’t need to have a huge garden to keep hens. So long as you have space for the housing and some space for them to dig about in, they’ll be happy. 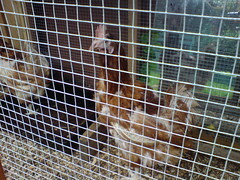 Ex-battery hens have been packed into a tiny cage for 18 months, so any space will seem enormous to them! A bit of grass is nice, they like a good graze, but if like me, you only have a small garden, you need to poo pick to keep the grass healthy. It’s all about management. Housing. There are many, many options for the housing, from wooden traditional houses to the new trendy houses. We went for a wooden traditional house as it fitted in with our garden and I prefer to use natural materials, it’s a personal choice though. This is the house we chose for our hens. We have two of these, end to end. 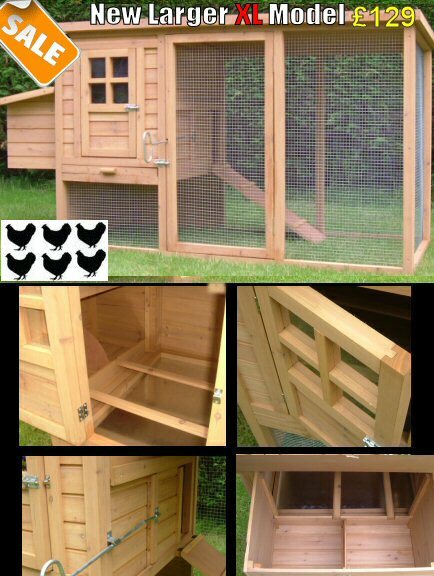 They are built to house 6 hens, so having 4 in each, gives them a little extra space. This house is from HenHouseWorld and we can’t recommend them enough. Prompt deliver, quality products and excellent customer servic all at reasonable prices. Here is the plastic equivalent for 6-10 hens. It’s called an eggcube and is from Omlet. It’s a little bit pricey compared to the wooden equivalent. I’ve not had any experience with these, so I guess it would be personal choice. There are many different options, and your choice should reflect on your personal circumstances. We choose the wooden design shown here as it’s fairly low and blends in to the garden. We don’t have a large garden and it’s long and narrow, so we didn’t want anything that would block our view down the garden. The one thing to bear in mind when choosing the material your house is made from is cleaning and maintenance. I would imagine the plastic houses are easier to keep clean and you could just hose them out. The wooden houses need looking after with regards to some kind of wood preservative and red mites. An outside pen can be very useful. 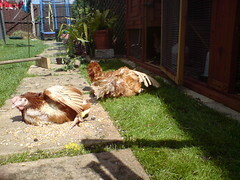 As mentioned, we only have a small garden, so some time in a pen can help when you need to rest the lawn or the cats! (hens like chasing cats) We have a little enclosed area outside of their run, as there are 8 of them, they need to have their own space to prevent arguments and boredom. Here is our run, we now have a temporary roof on it at the moment, which we will be replacing before winter. The next things to think about are feeders and drinkers. Hens can be very wasteful with their feed and again, it will depend on your hens as to which feeder is right for you. 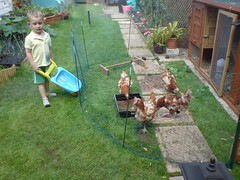 Our first hens were pretty tidy and a basic feeder was sufficient. When we got our second batch of hens, they weren’t so tidy. I ended up throwing a lot of wasted feed away. This is a 12 hen feeder. We switched to this once the newer hens started wasting so much feed. They used to stand in the old one and dig the feed out allover the floor. With this feeder, as it’s raised off the floor, they can no longer do that. It’s fairly heavy too, so there’s no chance of it being tipped over. The only downside is, it’s quite large, so it would be no good if you only have a small run. This was the type of feeder we started with. 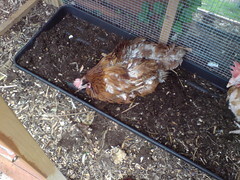 It sits on the floor, so the hens just stood and dug the feed out of the bottom. I tried to stand it on something, but it’s not very big and heavy, so it just got knocked over. If you have polite hens, this would be fine. The drinker is not so tricky, it needs refreshing everyday and cleaning regularly. Even if it looks clean, algae will build up, especially in the summer. Best way to check is to run your finger around the drinker, if it feels slimy, it needs a scrub. When it feels squeaky clean, it is! A friend of mine advised me before I got my hens, that they drink a lot, and she wasn’t wrong! 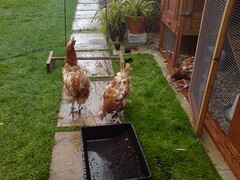 We have two 6 litre drinkers for our hens, I always feel it’s better to have too much water available than not enough. Here is the drinker that we have. I love the legs! It raises it off the floor so that the bowl doesn’t get filled with mud. 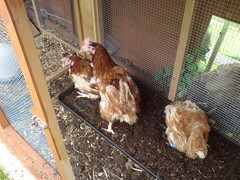 My hens love to dig and flick things everywhere and the one we had to start with sat on the floor and just got filthy. This one stays pretty clean! We have this one out in the pen, and one on the floor in the run. Our run is on paving slabs, so there is nothing to flick into the inside one! 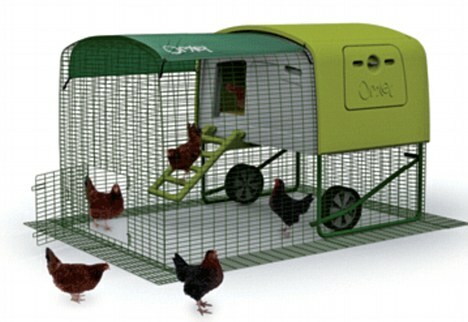 The next thing to think about is what will you feed your hens? 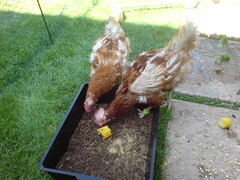 If you decide to go for ex-battery hens, the best thing for them to start with is Ex-battery crumbs. The hens will have been fed something similar in the battery farm and probably won’t eat anything else to start with. We used this for about 3 months before trying ours on the pellets (of the same brand) but, even now, our hens won’t eat pellets. You can buy the feed in various size bags, but due to postage and packing, it’s usually cheaper to buy it from a local supplier than from the internet. I use a farm shop near a yard I work at, but places like Pets at Home also stock it, but they do tend to be a bit pricey. It’s best to do some research before you get some hens, as availability will vary depending on where you live. Another consideration regarding feed, will be storage. It can’t get wet and you need to make sure the mice can’t get to it. I chose simple plastic rubbish bins from B&Q. They weren’t expensive and I’ve had no problem with them. When they’re empty, they’re light enough to be easy to clean and when they’re full, they’re still light enough to be moved about (worms hide under them too, so they need moving so the girls can have a snack). Again, this will depend on how many hens you have. I buy my feed in 20kg sacks, and the bins easily take a whole sack, with room to spare. Bedding! A difficult subject as many people will tell you what they think is best and why your choice is wrong, but to be honest, as long as it does the job and your hens are healthy and happy, then do what it right for you. We use shredded paper from the office! I don’t buy bedding. In the winter I mix a bit of straw into the paper, but that’s just to keep the bed fluffy! Straw can harbor bugs and if slightly musty, can cause respiratory problems, same with hay. There are many, many options and again, do your research, try a few out and decide what’s best for your hens. Parasite control. I’ve mentioned red mite, they’re probably the biggest challenge you’ll face! A wonderful product that I use is Diatomaceous Earth. I’ve found Diatom to be the best value and it works wonders. You can feed it for worm control, dust the hens and housing to control red mite and lice, heck you can even use it in your garden. We have neighbours trees down the side of our garden which are usually filled with sparrows. We’ve never had a major problem with red mite, but I have found a few. Since using the diatomaceous earth, I’ve hardly found any mite or seen any mite droppings. Fab! The key to keeping these beasties away though, is making sure you stay on top of keeping the house clean. Hens are easy to look after if you have a solid routine. They need cleaning out, feeding and watering everyday, other than that, they tend to take care of themselves. The other main parasites are worms and lice. We use a product called Flubenvet which is a powder you add to their feed to worm your hens. For lice, a dusting every 6 weeks of powder is all it takes! Again, I use the same stuff for the lice as for the red mites. The diatomaceous earth is natural and works by dehydrating the insects. It won’t harm your hens. I try to use natural products where I can, but only if it works. Eggs! If you have hens, you’ll have some lovely eggs! But the biggest thing we had trouble with was egg boxes! Sounds crazy, but when you have hens, you don’t buy eggs, so no egg boxes. So we rely on our lovely friends to give us their egg boxes, in return, we occasionally give them a full box back! Good swap I say! You can sell your eggs with no complications and it shouldn’t be too hard to find some customers. There are no eggs better than backyard hens eggs in my opinion! Well, I can’t think of anything else right now, but if I do I’ll post some more. Feel free to leave a comment or send a message if you think I missed anything. Remember, all of the above is what we found to work, be useful for us. What you do with your hens should be what’s best for them and what works for you. I hope this helped a bit. I will add another post regarding tips for the garden and actual day to day care but I’ll save that for another day. Some pictures from the garden. Now, as previously mentioned, I like gardening! I thought I’d put a few pictures up of some of my favorite plants from my garden. 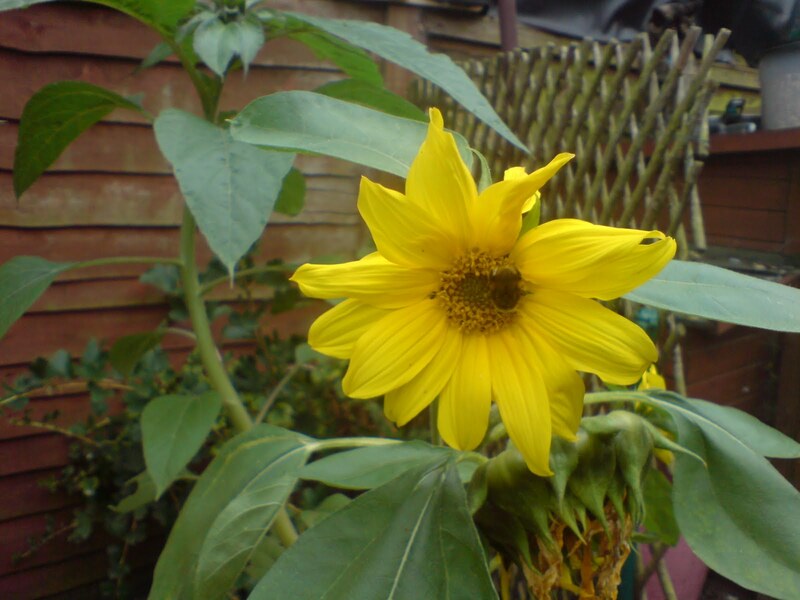 I love sunflowers, they’re easy to grow and the hens don’t seem to eat them….. These are red sunflowers, I do have one which is a lot darker than these, I’ll post it at the end. This is a miniature sunflower. The only one that survived. Sadly, the slugs got to the others. I was gutted. They seemed to come out of nowhere, and in one night, I had one seedling left. This is one of my strawberry plants. It has pink flowers, which I thought was odd, because I’ve only ever seen plants with white flowers. The strawberries are longer and have bigger seeds than our other (white flowered) plant. 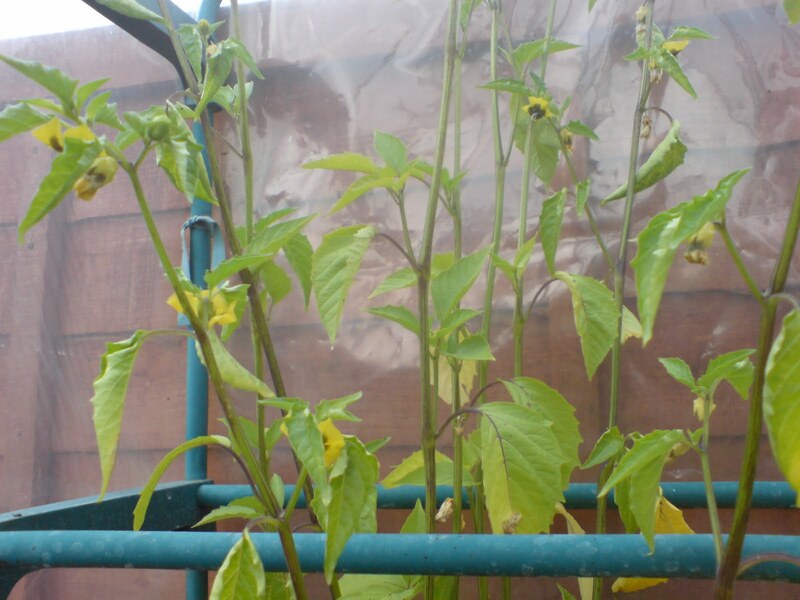 This is a Tomatillo plant. This is a plant native to Mexico. I thought I’d try and grow one. I had to germinate the seeds at 27 ‘C, which is tricky in this country!! Thanks to the un-seasonally hot spring, it grew, and grew and grew! I’ve yet to get any fruit from it. 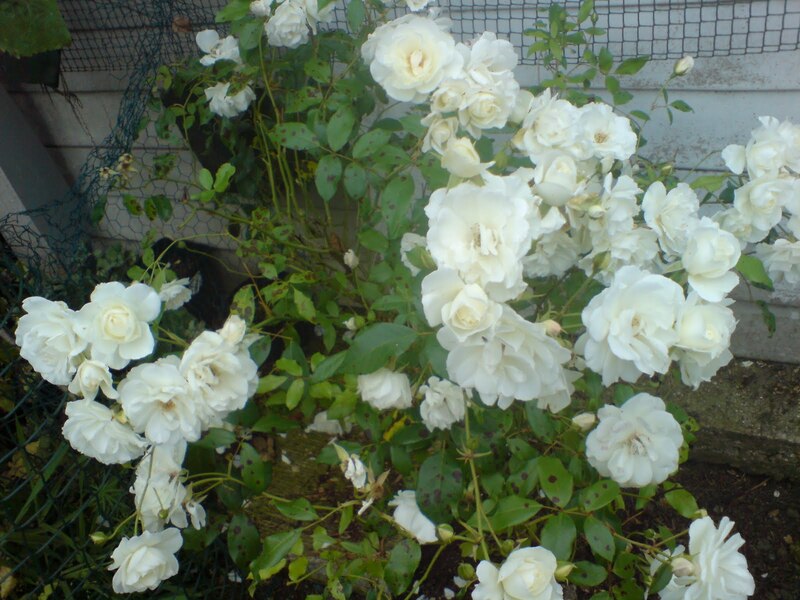 My beautiful climbing rose bush. We bought this last year, so it’s still a baby, but the roses are gorgeous. So long as I remember to ‘dead head’ the plant, it flowers all summer long. 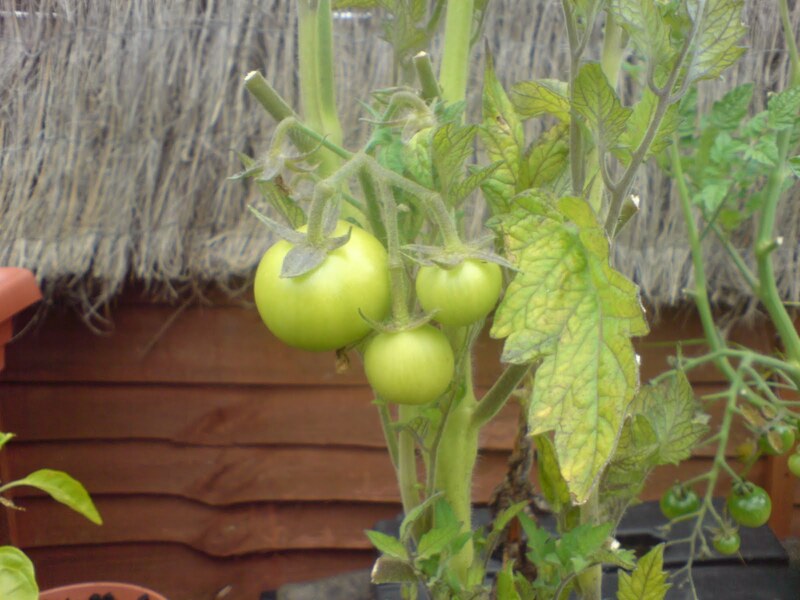 One of my tomato plants. I have some plants outside, some in the veg patch and some grown in a cloche. They’ve all fruited, the cloche fruit are bigger, but none has ripened yet. I’ve been very good and remembered to feed and prune them, so hopefully all the fruit will ripen soon. 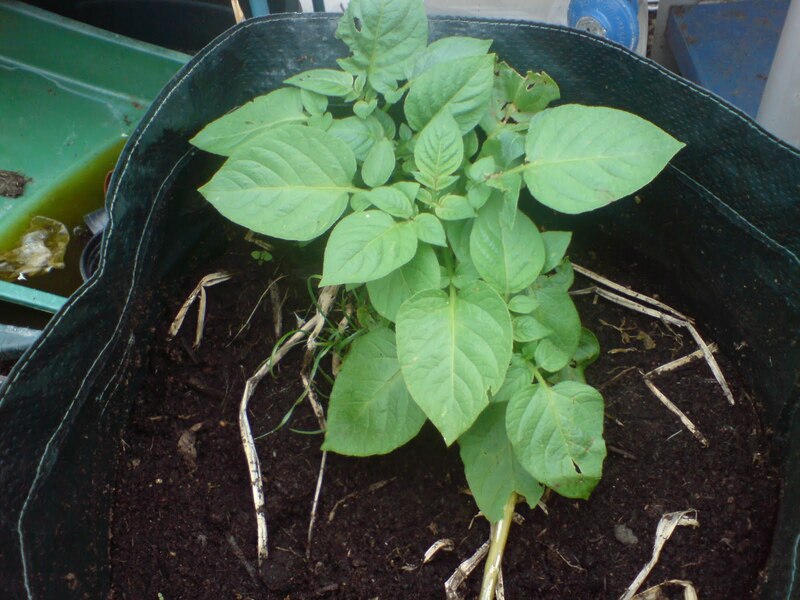 My potato plant. This is the first year I’ve grown potatoes. We’ve already had one crop from this plant and this is the second sprouting. I’m hoping to get another crop as the potatoes were lovely! 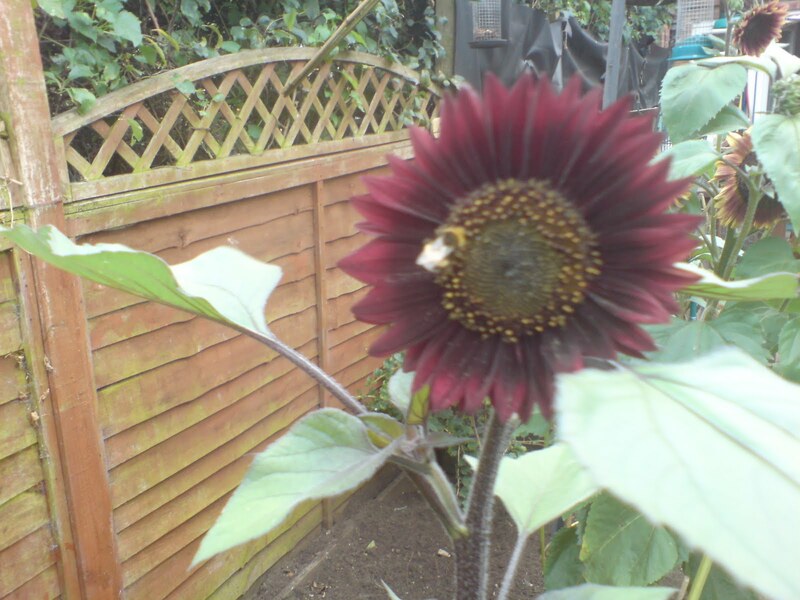 This is the lovely dark red sunflower. 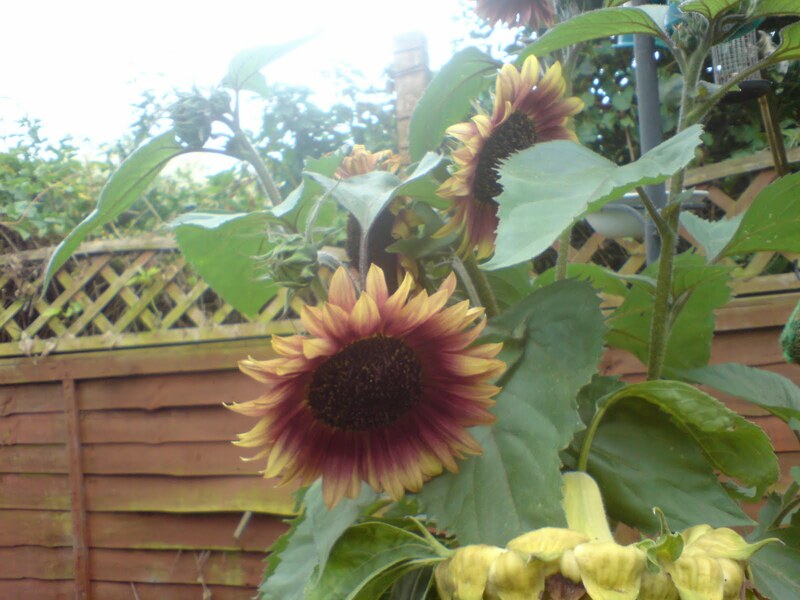 We do have some giant sunflowers too, but it started raining before I could get a photo. I’ll upload one soon. 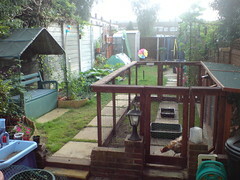 Those are just a few of our plants, we also have beetroot, chilli, courgettes, lettuce and carrots (orange and purple). The hens make veg growing a little tricky as everything has to be fenced off or put out of reach! But as rotivators, you can’t beat a hen! I thought it was time to write about our wonderful truck, Frank. For a couple of years now I have been driving a small, Ford Fiesta named Filbert. This is Filbert. A 1998, Mark 5 Fiesta. 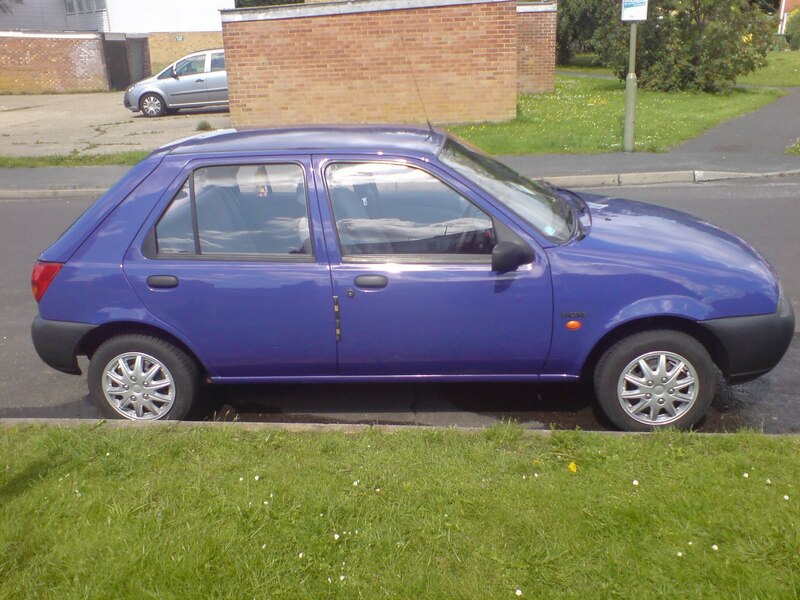 1.3 petrol engine and 60BHP…..
We bought him after some idiot crashed into our Citroen Berlingo ‘Bernie’. I like purple, and Filbert was perfect. We had a few teething troubles to start with due to him not being looked after very well by his previous owner and the dealer we bought him from being a total douche bag, but generally, he’s a good boy and he’s never let me down. …. this is ‘Frank’. 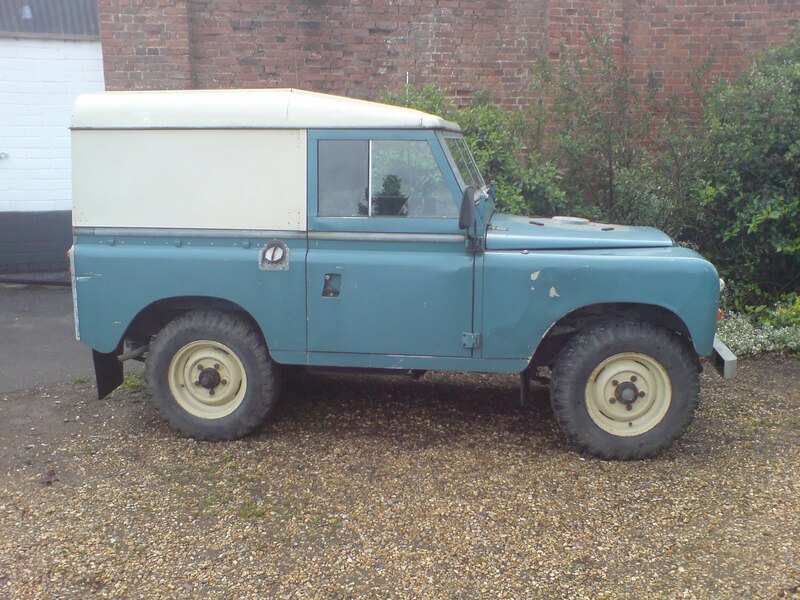 A 1977 88″ Land Rover Series III. 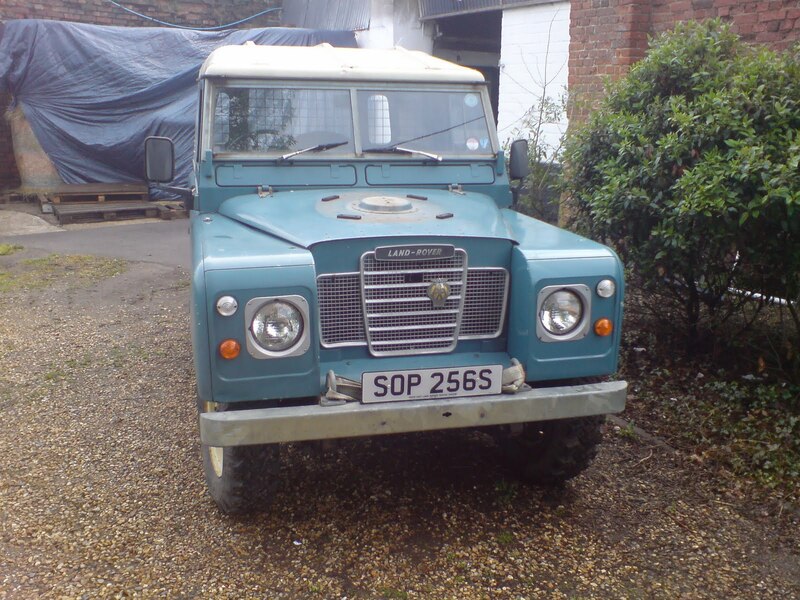 I’d been on the lookout for a small 4×4 for work and I saw this little guy at a farm shop whilst buying chicken feed. It was love at first sight. He needs a paint job, but aside from that he’s immaculate. Now Filbert has done a good job. I’ve driven him in all weathers and road conditions. He even kept me mobile in the deep snow…. once it started to get above a 1ft however, I could hear it scraping along the bottom of the car. So I begun looking, we looked into the Vitaras, Explorers and other such, but none seemed right. 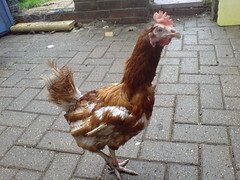 Then, one day whilst shopping for chicken feed at a farm near to a yard I work at, I saw Frank for sale. I looked him over and couldn’t find anything wrong, the underside was rust free and had been treated in the past, but needed doing again and there were no horrible leaks anywhere (for an old Landie). I spoke to the owner and found out the truck had been owned by a former employee who could no longer afford to keep it as she split from her husband. She had to sell her horses, car, everything. Very sad. So Frank had been doing odd jobs round the farm. He’d been MOT’d a few times, but not every year and as there was a garage on site, I guess he’d been kept in pretty good shape. Aside from a few dents and scratches, there was nothing I could see that raised alarm. I asked my knowledgeable friend to come and take a look at Frank to see what he thought, and he was very impressed and at the price they were asking, I couldn’t say no. So I agreed to buy him. I told my husband, who didn’t actually get to see Frank until I picked him up and paid for him a couple of days later! My husband has always loved Land Rovers. He’d had an A reg Range Rover a few years previously and loved it. But due to his commuting needs, a Land Rover just wouldn’t be viable. He does over 100 miles a day up and down the M3, so he has an old Audi A4 that manages to do 60MPG. Frank is averaging about 18-22MPG, so you can see the problem. Anyway, I tend to work close to home, due to Alex being so young and occasionally being called back to school to pick him up, so Frank is ideal for me. I don’t like new cars, I can’t handle electrical and complicated things, so again, Frank is ideal! We’ve had Frank for just over a month now, and are slowly doing little bits to tidy him up and make him run at his best. My husband and our knowledgeable friend have started to service Frank. He’s had new HT leads, plugs, a new ignition coil and he’s just about to get his points done too. See the post ‘busy day’ LOL! We plan to have Frank re-painted too and replace or bang out the front wings as they have ‘farm dents’ on them. As Frank has less than 6,000 miles on his clock, due to sitting around twiddling his thumbs, he is in very good condition, still has all the factory plates in the cab and engine bay, and you can read them!! The engine bay itself is very tidy and was just a bit grubby, but after a clean, it shows his low mileage. Here is Frank from the front. Gorgeous! His spare tyre was removed at this point, as we had no way to lock it onto the bonnet. This has since been resolved as he looks a bit odd without it in it’s proper place! We also had to remove the AA badge too, as I know someone would nick it. But as you can see, he’s in excellent condition for his age. I shall write about Frank as we do bits on him. Refer to our main blog for technical stuff, as that’s more my husbands area…. I’m learning but still very very novice!! So that’s Frank and little Filbert. Both lovely cars, there is no reason why both their names begin with ‘F’ that’s just how it turned out. Today I thought I’d tell you about my working journey so far, might not be too interesting, but here goes. I started my first job at the age of 13 with a paper round. I stuck at it and eventually when I was 15 I also worked in the shop on a Saturday! I enjoyed this job, they were very nice people. Sadly the shop I worked doesn’t exist anymore. I’ve never had my own horse as they are very expensive to keep. I choose to go to college instead of a pony as a child and now I have a child. Horses are very time consuming and potentially very expensive, especially if things go wrong. I have, however, been lucky enough to have been around horses for most of my life. I started riding when I was 7 years old. I was due to have my first lesson on my 7th birthday, but sadly had chicken pox, so I had to wait a few weeks! I believe my first ever ride was on a donkey, or that’s the first one I remember anyway! I grew up in Portsmouth near Fratton park, which isn’t renowned for it’s huge amount of horses!! I started riding at Westcroft Riding school, on Hayling Island, which has changed hands many times since then and is now a livery yard I believe. 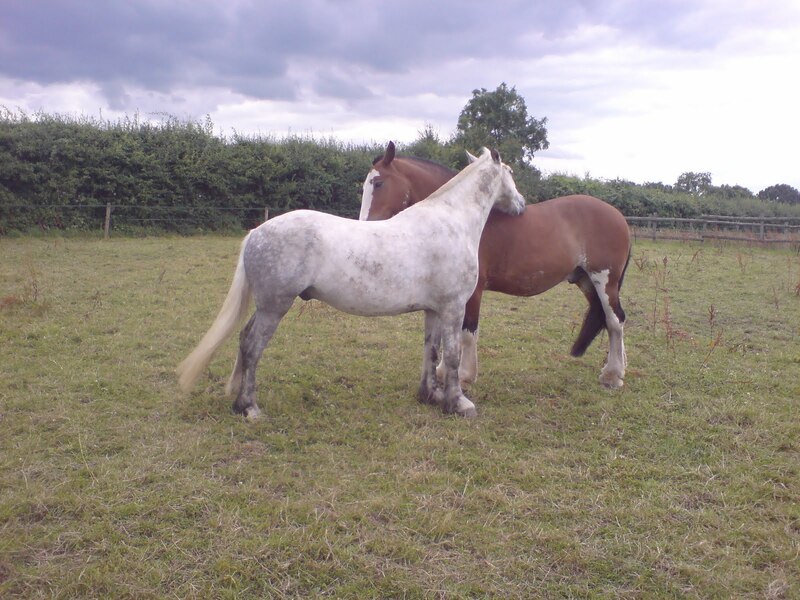 After Westcroft, I started at Fort Widley Equestrian Centre (http://www.peterashleyactivitycentres.co.uk/Widley.htm). I rode here and helped here as much as I could until I turned 16, when as mentioned in an earlier post, I went to Sparsholt College (http://www.sparsholt.ac.uk/) where I did a 2 year National Diploma in horse management. This was great fun, and this is where I was introduced to Dryad Naval Riding Centre (which is sadly closed down now). After college I got a job here as a working pupil. It was very, very hard work, but worth it all. I managed to work through the BHS exams to BHSAI (British Horse Society Assistant Instructor) (https://www.bhs.org.uk/). I worked there for just under 5 years before moving on to try a ‘normal’ job in an office. Big mistake, I worked in a ‘customer service centre’ (call centre, but we weren’t allowed to call it that) for about 5 years. I helped a friend with some horses in my spare time to get my horse fix, but I was so miserable. I hated working indoors. I was so depressed and just wanted to get out. I moved on to a night job for a year working at the Naval Base in Portsmouth for a civilian company who were contracted to look after and provide accommodation on the base for Navy/Army personnel. It was much better than the office job as I worked in a portacabin and could walk around the accommodation blocks whenever I liked. Still wasn’t for me though. My husband and I got married in 2002 and we’d been looking at options, where to live etc…. we decided that we both wanted an outdoor life and looked at emigrating to Canada or New Zealand. New Zealand proved to be far too expensive, so we chose Canada. We started the process but halfway through decided it might be better to find our feet and stay in the UK. After I left the night job on the Naval base, we decided to try for a baby. We’d been married for just over 3 years. I had our son, Alex, in May 2006 and didn’t go back to work again until he was over a year old, and even then it was only for 1 day at the weekend. We managed to move from Portsmouth to Farnborough just after I had Alex (was meant to be before, but that’s another story). In 2007 I decided to go back to teaching and found a local riding school who I worked for on a Sunday teaching their clients. I worked for the owner for just under 3 years, when in 2010 I decided and had the opportunity to go self-employed. I still only work part time, but it fits in nicely around my parenting job! My son is 5yrs old now and is at school, so I try to work whilst he’s out at school. I work at GBB Horse Care in Farnham (http://gbbhorsecare.co.uk/) on a Saturday and usually go down on a Thursday whilst Alex is at school. It’s owned and run by my good friend Jules. She’s based in Farnham at Old Park Stables and is very good at what she does. This is Greyson and Billy. Greyson is Jules’ own horse and has had many problems, he’s only 8 and very lucky to be owned by someone so patient and kind. He came over from Ireland as a 3yr old through a dealer and ended up on a riding school. He developed problems from bucking, spooking and eventually, head shaking. Jules has been so patient, tried everything, but at the moment, he can only work properly in the winter. He’s happy in the field and is not in pain, but as soon as he’s starts to work or gets stressed, he starts to head shake. There are a few environmental factors that trigger it too, such as sunlight, sun after rain, pollen, but as with most head shakers, it’s very difficult to pin point exactly what sets it off. He is a credit to her patience and hard work. 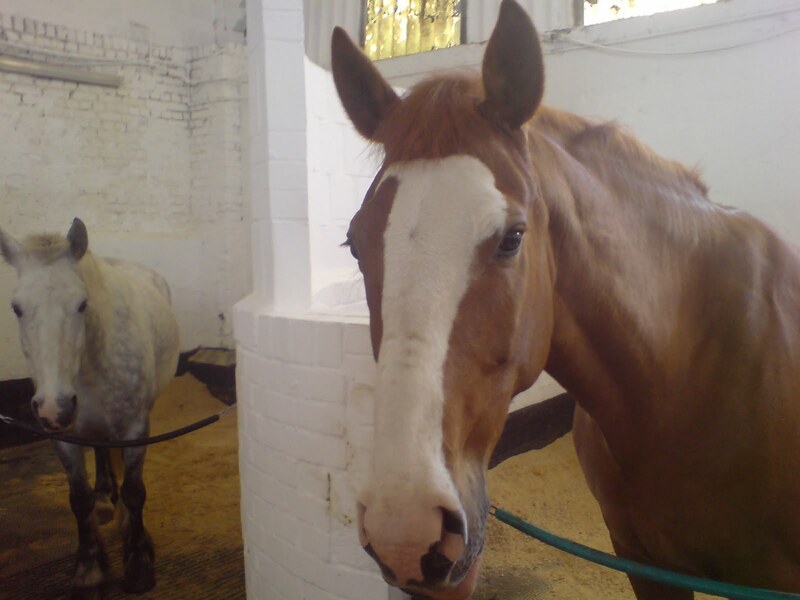 As well as working at GBB, I also work a couple of horses for their owners at a DIY livery yard in Bordon, Hampshire. These include Orla, Milly and Guiness (when his owner goes away). 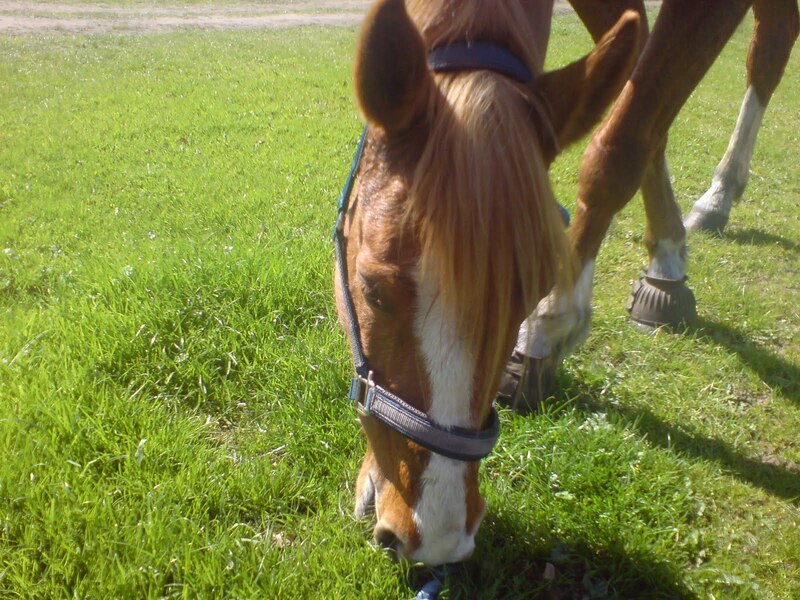 This is Orla, a lovely mare. She’s an Irish sportshorse who competes at riding club level with her owner. Her owner is a teacher, and so I go up once a week to long line Orla, just to keep her supple. She’s a real character and I’m very fond of her. She loves fuss and pears! 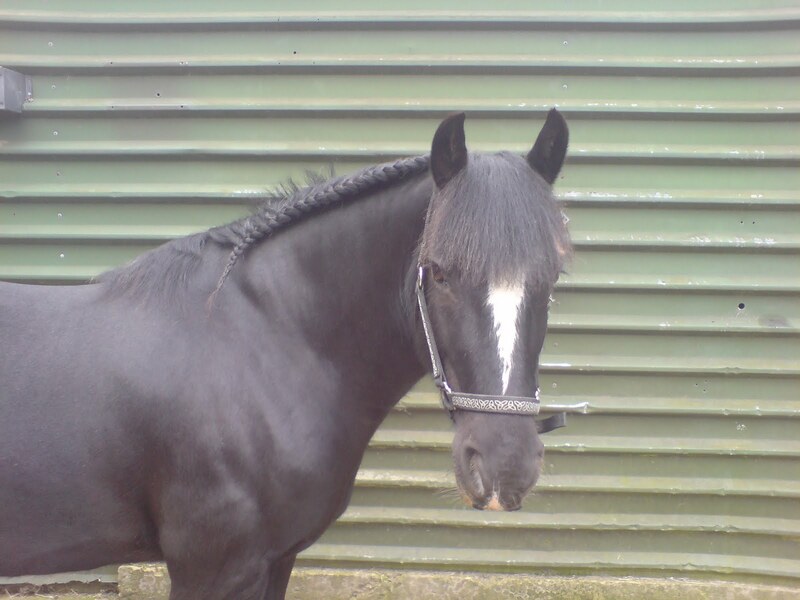 This is Guiness, a lovely little Irish cob gelding. I think he’s about 14, can’t remember exactly though. I take him out for a hack when his owner goes away. We always have lots of fun and he’s very well behaved. Can be a bit wussy sometimes though….. This handsome devil is Ben, he lives at GBB Horse care with Greyson and Billy (above). He is an Irish Sportshorse. He’s very sweet, but has had troubles with his back, hocks and feet. Hopefully though, he’s back on track and his owner can get on with some fun stuff again! This is just a brief history, there were some interim bits that I haven’t mentioned, like temp jobs and such, but it has taught me that I NEED to work outdoors with horses. Once Alex is a bit older I’ll be able to do more and maybe one day, I’ll have a yard of my own. Until then though, I consider myself very lucky to have such supportive friends and a wonderful husband, that I am able to keep working with these wonderful animals. If anyone reading this fancies a career in horses, it’s hard work, very hard work, but what you put in, you get back out. The money is rubbish, but the benefits make it all worth while. Do your research and be prepared for very long hours!